A Cognac for the Triumphant moments of life! The Hine story dates back to 1550, when the Hine family lived in Beaminster, Dorset, on the south coast of England. The family's great Cognac journey was to begin in the 18th century: Thomas Hine, the father, a linen merchant — and quite a Cognac connoisseur — decided to send his son Thomas to France to learn French and the art of making Cognac. Thomas travelled to Jarnac, a small town just east of Cognac and since 1763, Jarnac had been the base for their premises where Thomas set up shop and ultimately created Hine, his father’s and many millions of others' favourite Cognac. - They have been awarded The Royal Warrant for the Supply of Cognac to Her Majesty Queen Elizabeth II, the only Cognac to have ever received this honour. 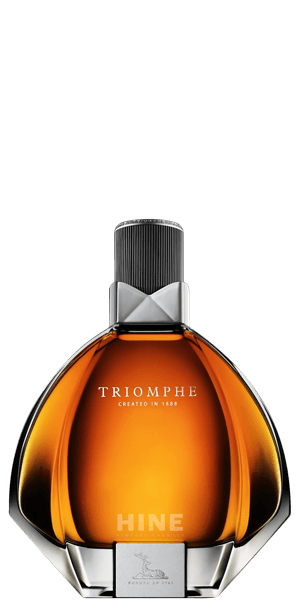 What does Hine Triomphe Cognac taste like? The Flavor Spiral™ shows the most common flavors that you'll taste in Hine Triomphe Cognac and gives you a chance to have a taste of it before actually tasting it.